I just returned from the 2018 Intruder Association reunion in which I was able to purchase several collections from Pilots/Bombardier-Navigators that were there. 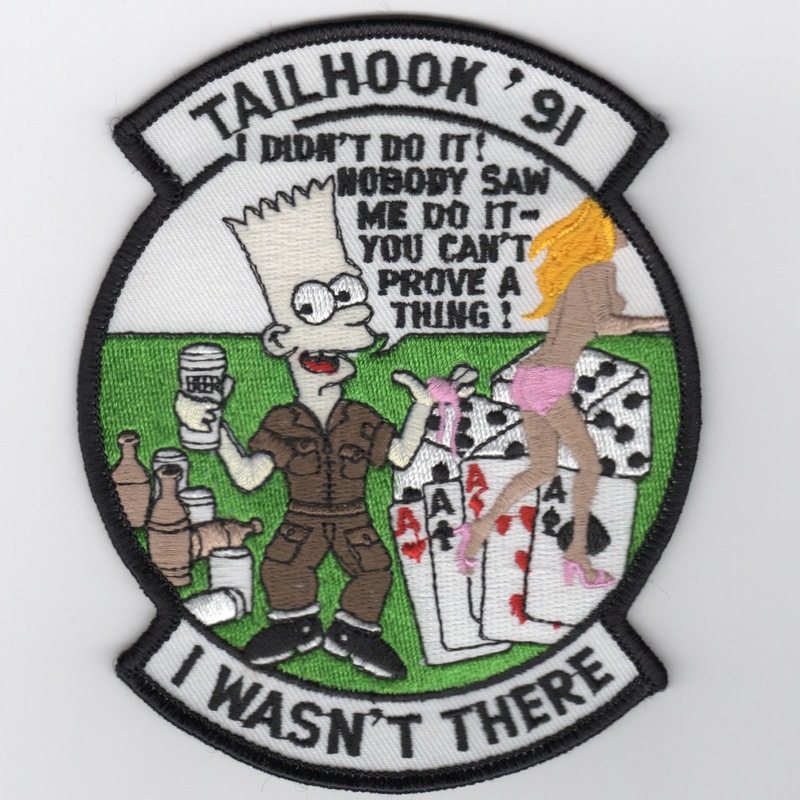 In one of the purchases, we picked up a couple of dozen of the ORIGINAL TAILHOOK '91 patches that had Bart Simpson on it. This was the most crippling event in modern Naval Aviation history due to some sexual harassment incidents. One of my old instructors had these he had forgotten about, until he started planning for this reunion. These are very cool, historical, and do not have velcro. 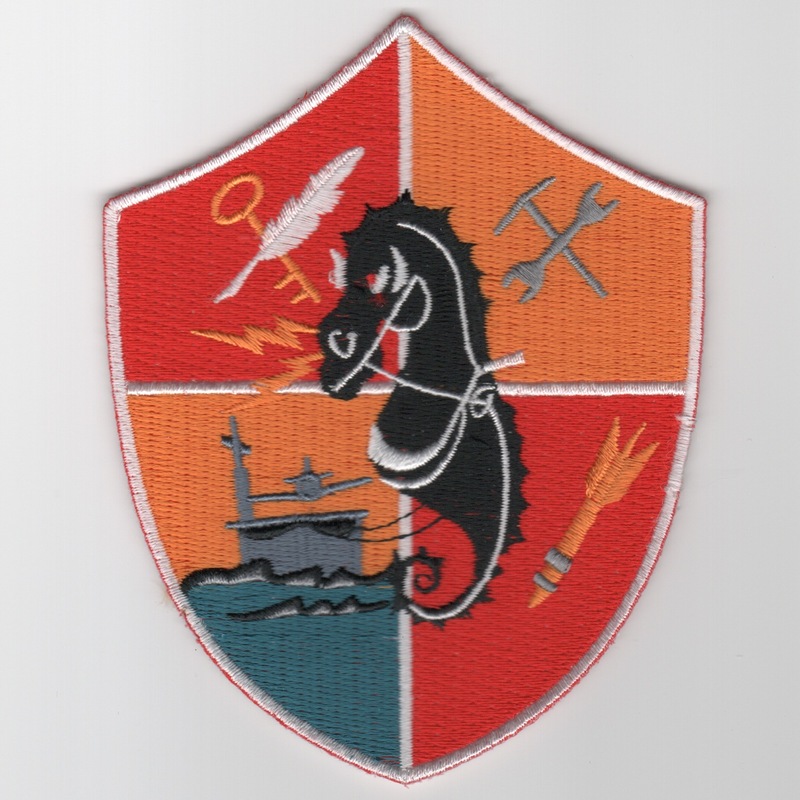 This patch was created recently to commemorate the "Show of Force/Power Projection" that the US Military demonstrated when the North Korean leader started "acting up" in that region. 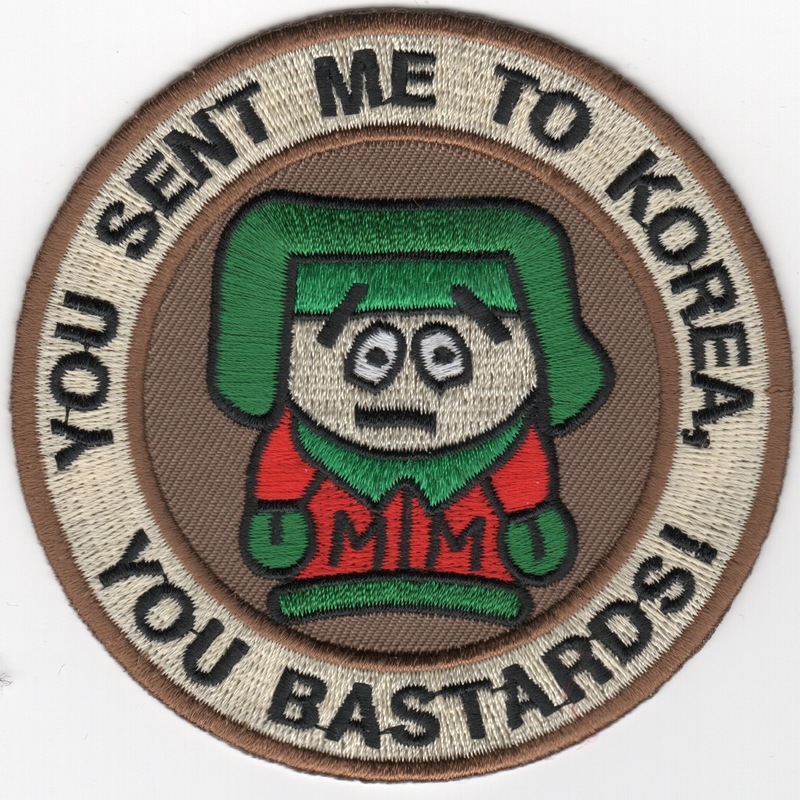 It shows the TV Show character "Kenny" from South Park saying "YOU SENT ME TO KOREA" (along the top) and "YOU BASTARDS" along the bottom. This patch does not have velcro. This patch was created recently to commemorate the "Show of Force/Power Projection" that the US Military demonstrated when the terrorist leaders/ISIS started "acting up" in that region. 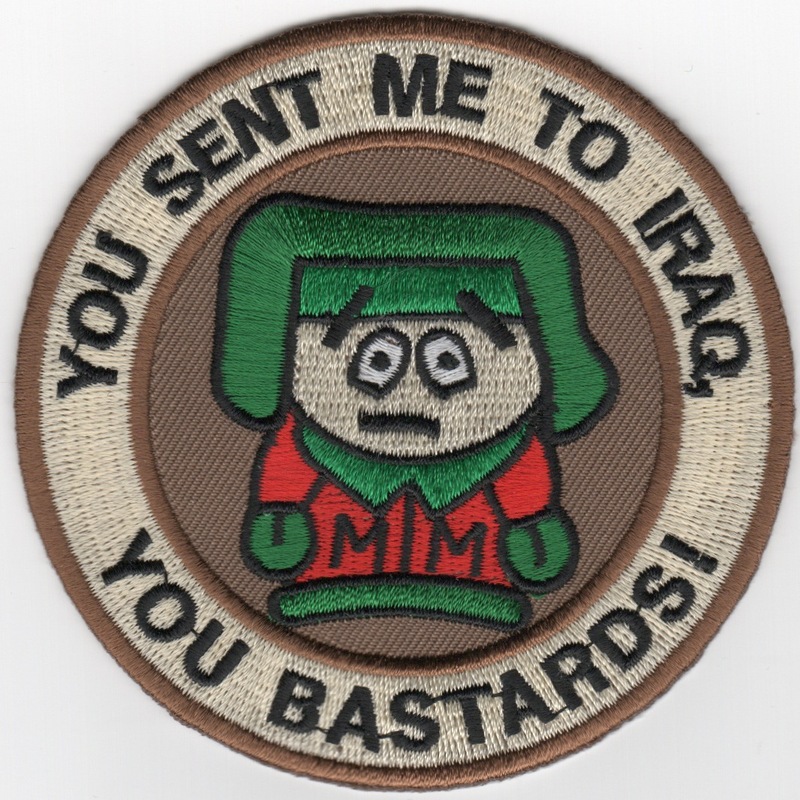 It shows the TV Show character "Kenny" from South Park saying "YOU SENT ME TO IRAQ" (along the top) and "YOU BASTARDS" along the bottom. This patch does not have velcro. This patch was created recently to commemorate the "Show of Force/Power Projection" that the US Military demonstrated when the terrorist leaders/ISIS started "acting up" in that region. 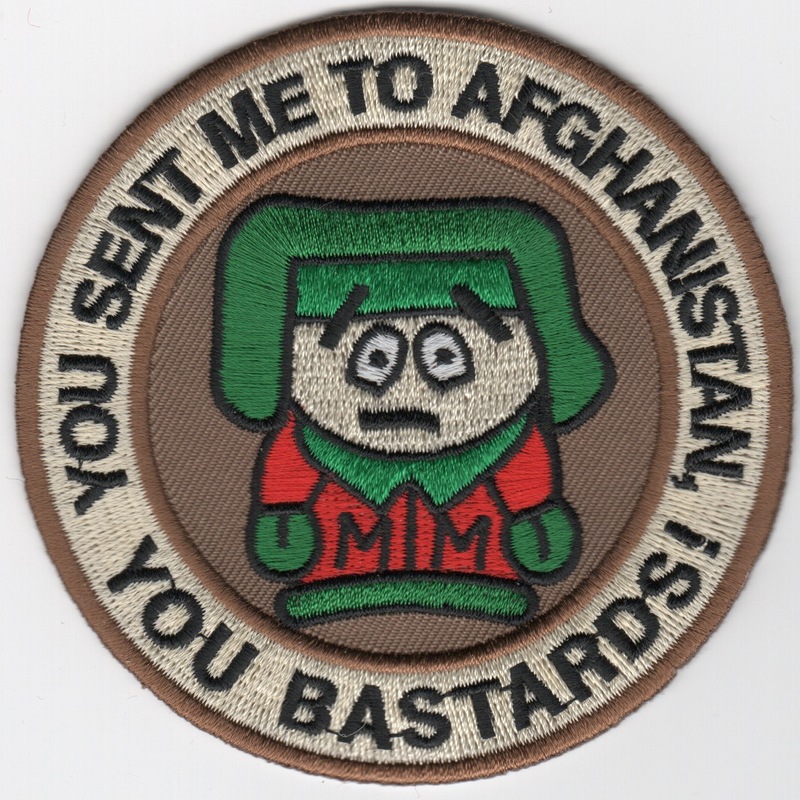 It shows the TV Show character "Kenny" from South Park saying "YOU SENT ME TO AFGHANISTAN" (along the top) and "YOU BASTARDS" along the bottom. This patch does not have velcro. This patch was created recently to commemorate the "Show of Force/Power Projection" that the US Military demonstrated when the terrorist leaders/ISIS started "acting up" in that region. It shows the TV Show character "Kenny" from South Park saying "YOU SENT ME TO KUWAIT" (along the top) and "YOU BASTARDS" along the bottom. This patch does not have velcro. 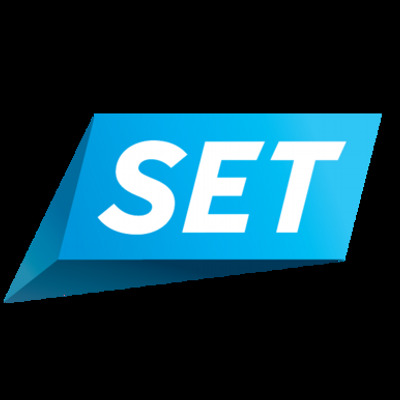 Use this link for the set of "Kenny" patches. These patches do not have velcro. 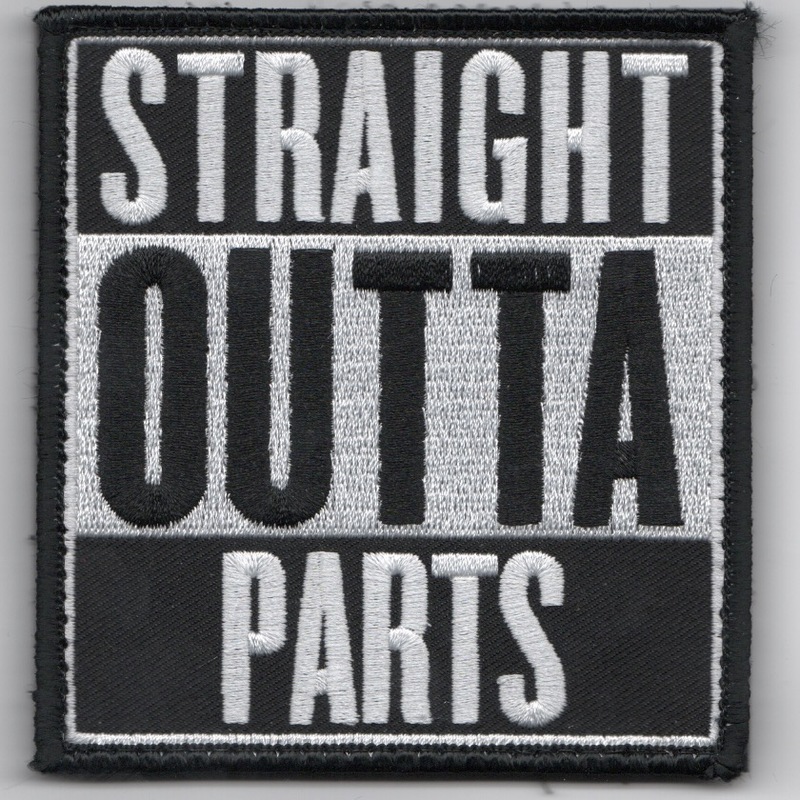 Another AV8RSTUFF Creation: This patch was created for one of the West Coast squadrons (remaining anonymous per their request) which is a play on the movie, but pertains to the state of "spare parts" on the boat!! Pretty much applies to all branches of the military, as that's the hardest thing to predict.....what will fail and what to spare! This patch DOES have velcro attached. This is the large, black version (pirate colors) of one of the most famous patches in all of military aviation. 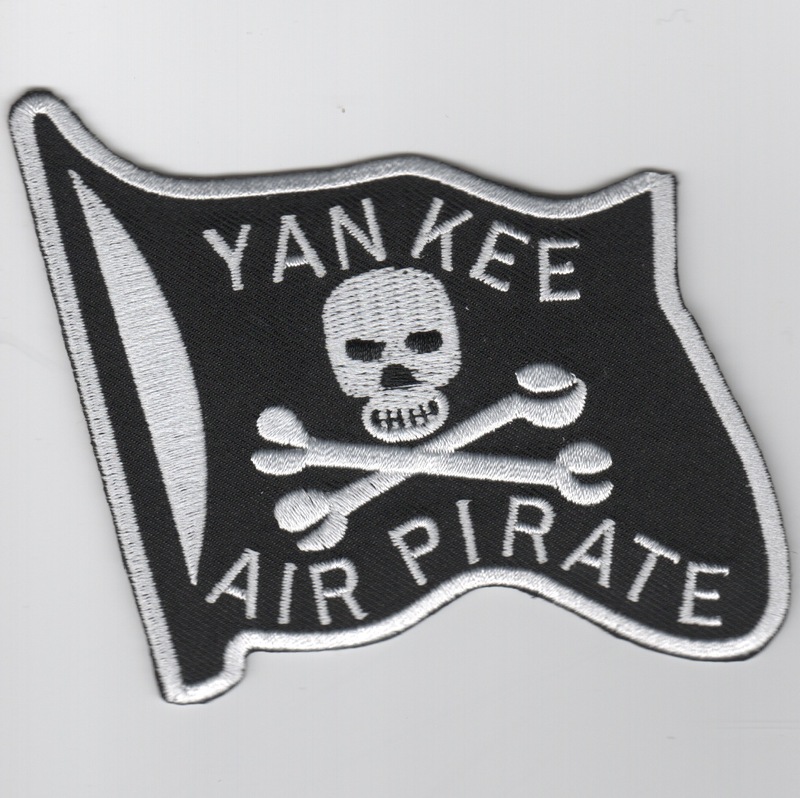 This is the Yankee Air Pirate patch......This patch does NOT come with velcro attached. This is the large, black version (pirate colors) of one of the most famous patches in all of military aviation. 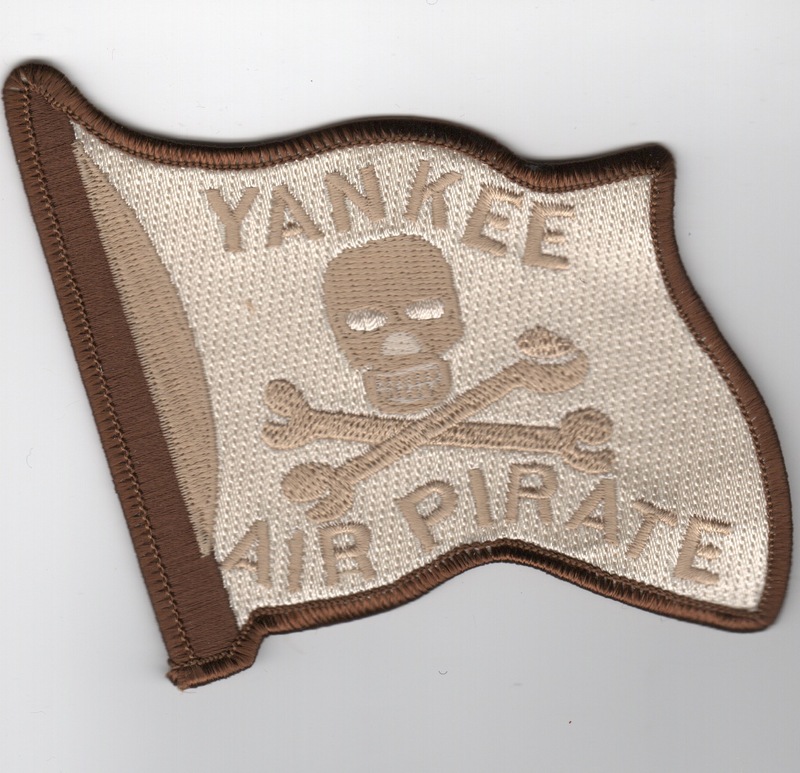 This is the Yankee Air Pirate patch......This patch DOES come with velcro attached. This is the small, black version (pirate colors) of one of the most famous patches in all of military aviation. 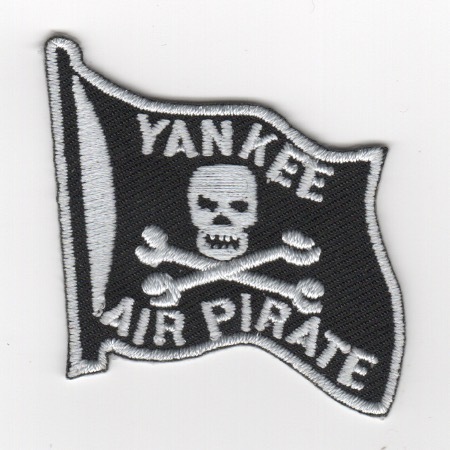 This is the Yankee Air Pirate patch...... This patch does NOT come with velcro attached. This is the large, desert version of famous Yankee Air Pirate patch. This patch does not come with velcro already attached. This is the large, desert version of famous Yankee Air Pirate patch. This patch does come with velcro already attached. This is one of many versions of the US NAVY LOGO....this patch does not come with velcro attached. 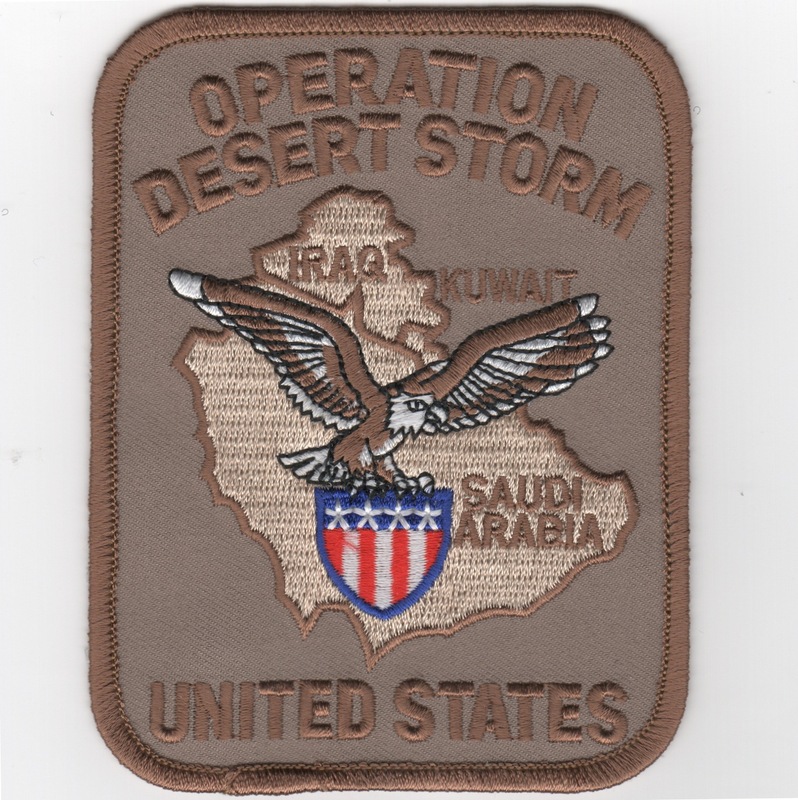 This is the desert version of the Operation DESERT STORM rectangular patch and says "UNITED STATES" along the bottom. 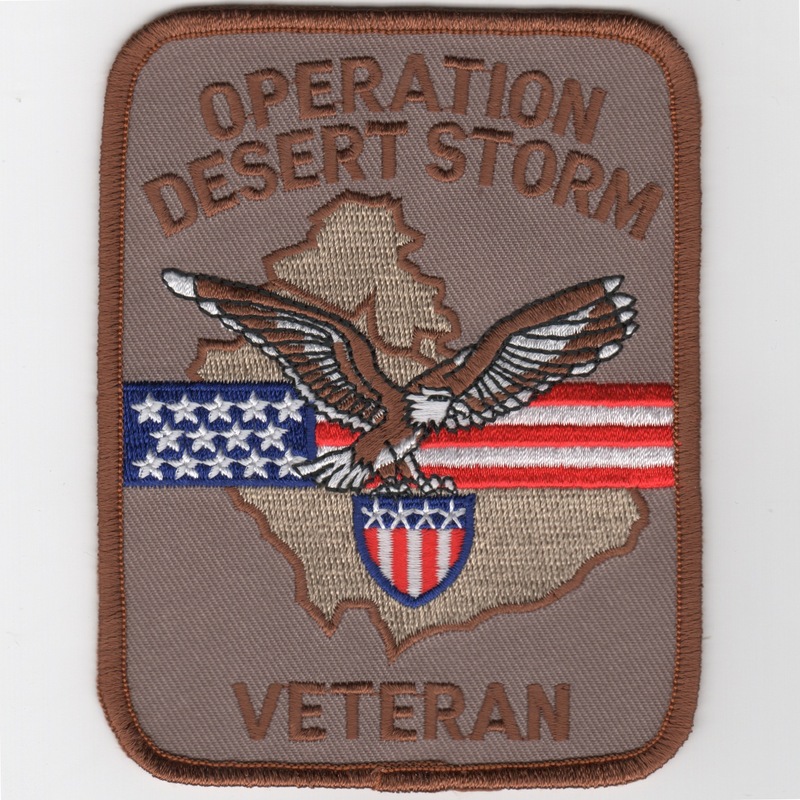 This is the desert version of the Operation DESERT STORM rectangular patch and says "VETERAN" along the bottom. 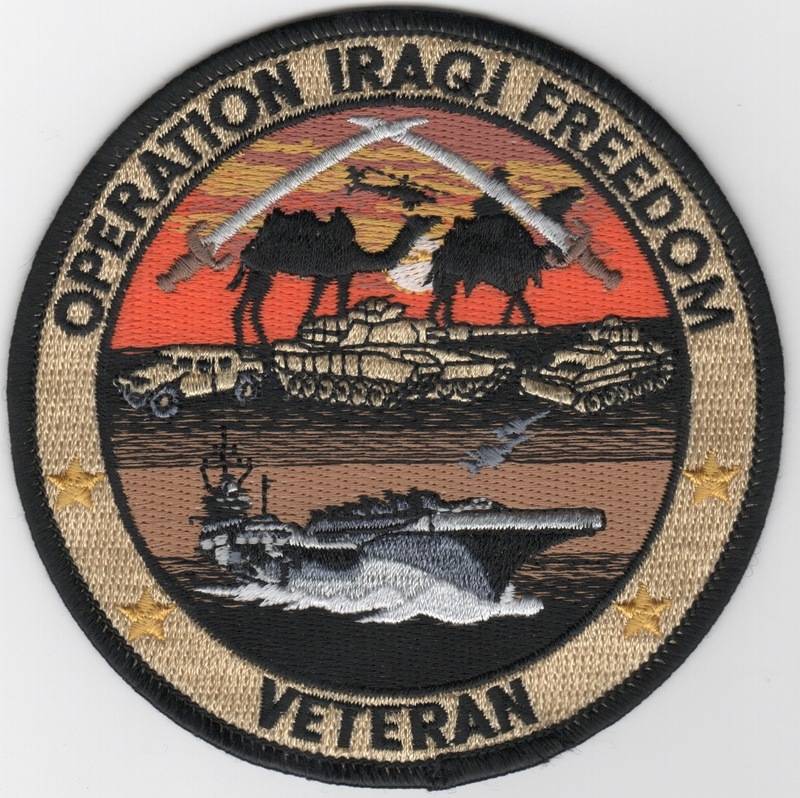 This is the round version of the OIF patch that shows the Army tanks on the top and the US Navy's aircraft carrier on the bottom with the lettering "VETERAN" along the bottom. 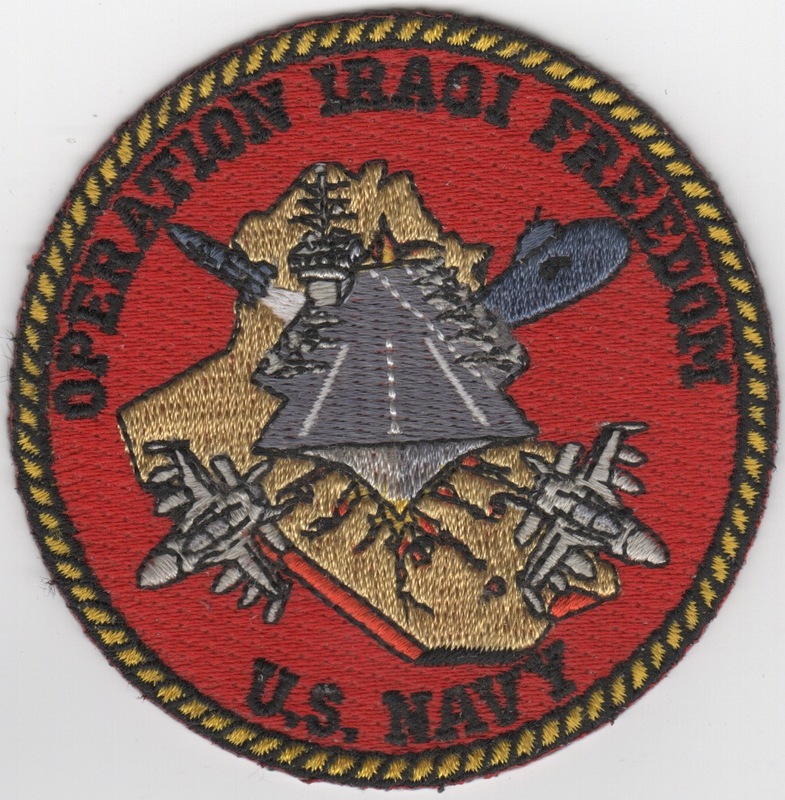 This is the red version of the round OIF patch that shows a US aircraft carrier, airwing and Strike Group over the country of Iraq. This is the rectangular version of the black OEF patch. 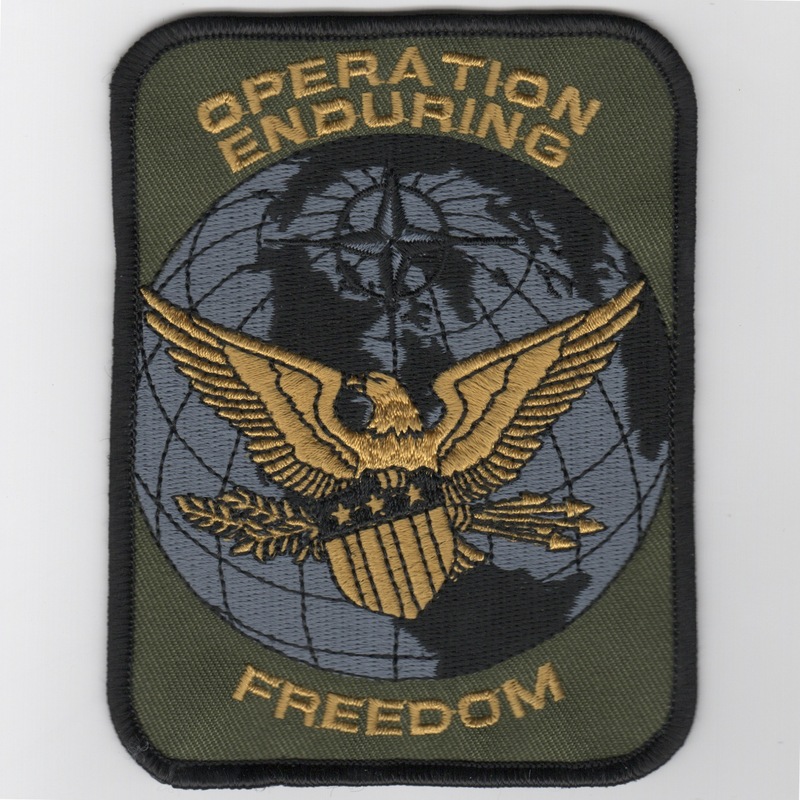 This is the rectangular version of the subdued green OEF patch. This is the "Fleet Aircraft Service Squadron (FASRON) FOUR", which was stationed at NAS Jacksonville, FL. A Service Squadron (ServRon) was a U.S. Navy squadron that supported fleet combat units. Service Squadrons were used by the United States Navy from their inception in 1943 to as late as the early 1980s. 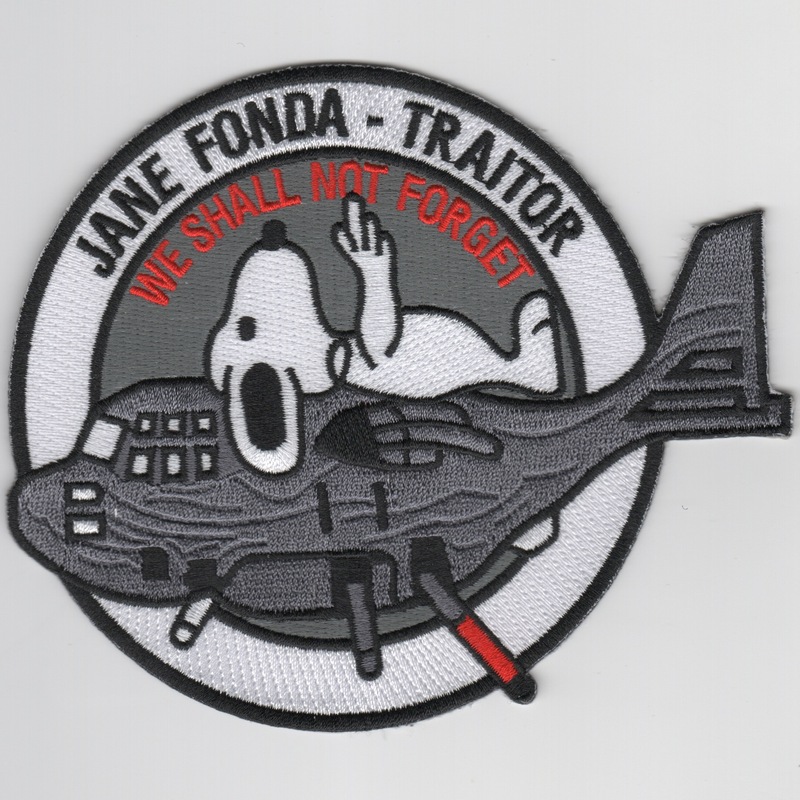 This is the squadron patch for FASRON-4 and does not have velcro attached. This is the "Fleet Aircraft Service Squadron (FASRON) SIX", which was stationed at NAS Jacksonville, FL. A Service Squadron (ServRon) was a U.S. Navy squadron that supported fleet combat units. Service Squadrons were used by the United States Navy from their inception in 1943 to as late as the early 1980s. 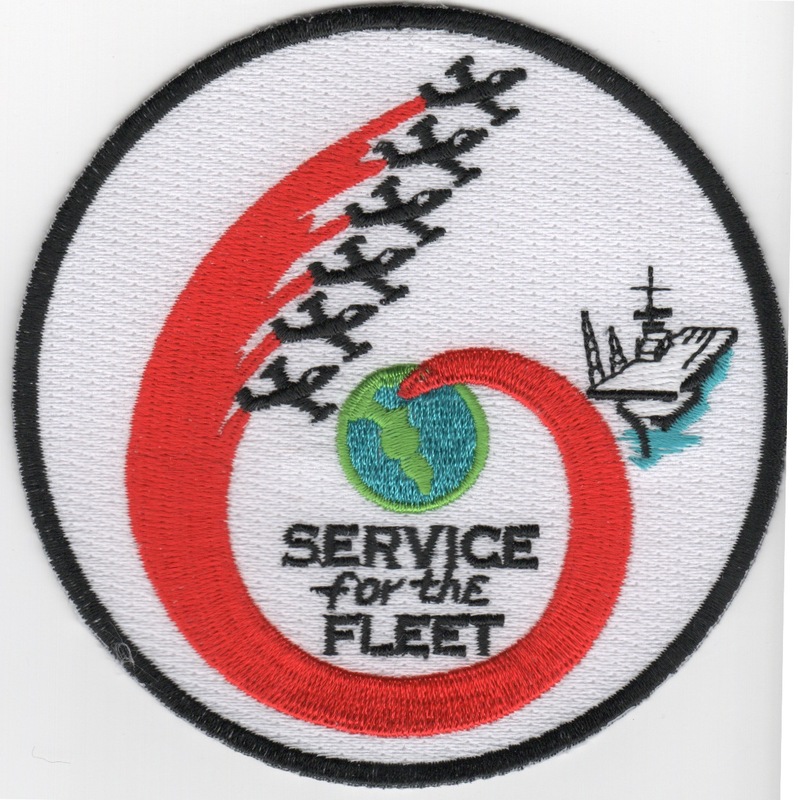 This is the squadron patch for FASRON-6 and does not have velcro attached. 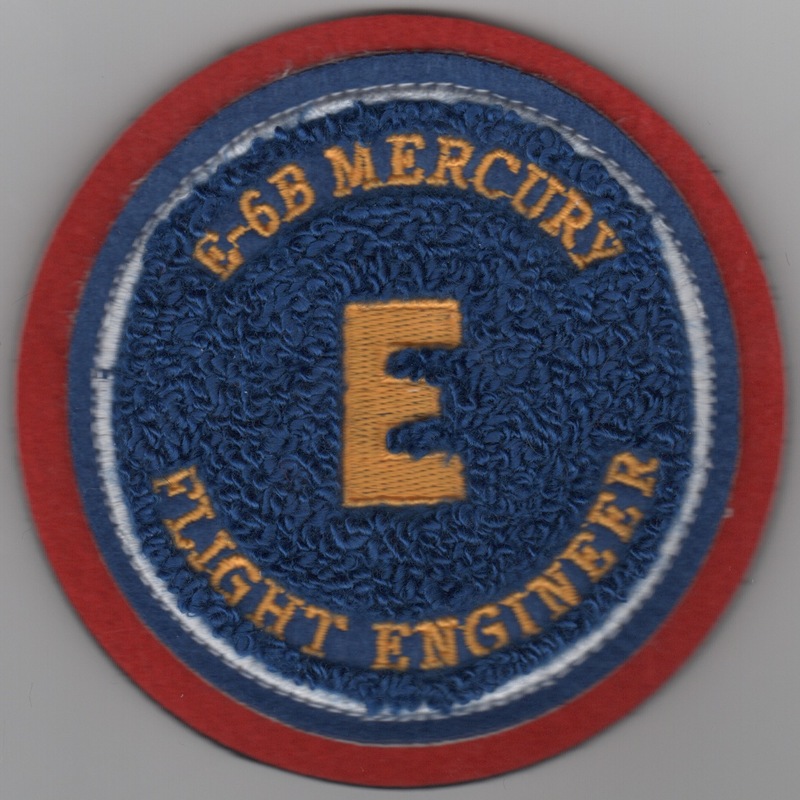 This is a patch created for the Flight Engineers that fly on the E-6B Mercury aircraft out of Tinker AFB, OK. The Boeing E-6 Mercury (formerly E-6 Hermes) is an airborne command post and communications relay based on the Boeing 707-320. The original E-6A manufactured by Boeing's defense division entered service with the United States Navy in July 1989, replacing the EC-130Q. It conveyed instructions from the National Command Authority to fleet ballistic missile submarines (see communication with submarines), a mission known as TACAMO (TAke Charge And Move Out). The E-6B model deployed in October�1998 kept this role, but added further command post capabilities and control of land-based missiles and nuclear-armed strategic bombers. The E-6B replaced Air Force EC-135Cs in the "Looking Glass" role, providing command and control of U.S. nuclear forces should ground-based control become inoperable. With production lasting until 1991, the E-6 was the final derivative of the Boeing 707 to be built. This is a patch we had done for a customer of ours. I just got it and I have already sold a bunch to the guys in my squadron. It shows the incredible Chuck in a fighting stance and states, "WWCND?" across the top. 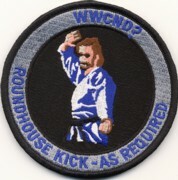 It has "Roundhouse Kick - As Required" across the bottom. Why Chuck? Everyone knows that, "There is no theory of evolution. Just a list of animals Chuck Norris allows to live". This patch comes with velcro already attached. This is a patch we had done for a customer of ours. It is given or used for vistors or PAX riding on the helicopter. It's very true. You get the folks in the helo and don't want them to touch anything and not say a word. While the picture has the bad word blocked out -- THE PATCH YOU ORDER WON'T. This patch does not come with velcro. This is a replica type patch meant to look like the old WWII propaganda posters -- with a twist. The patch shows a pilot getting out of his airplane. On the top it says "YOU Shut The Hell Up". Below the pilot it says "WE'LL Protect America". On the bottom in small letters it says "Keep Out Of Our Fuc&ing Way, Liberal Pu$$ies. I covered up the actual patch for the photo on the web-site, but rest assured, the patch you order WILL have the explicit words on it!!! Damn cool patch! This patch does not come with velcro attached. 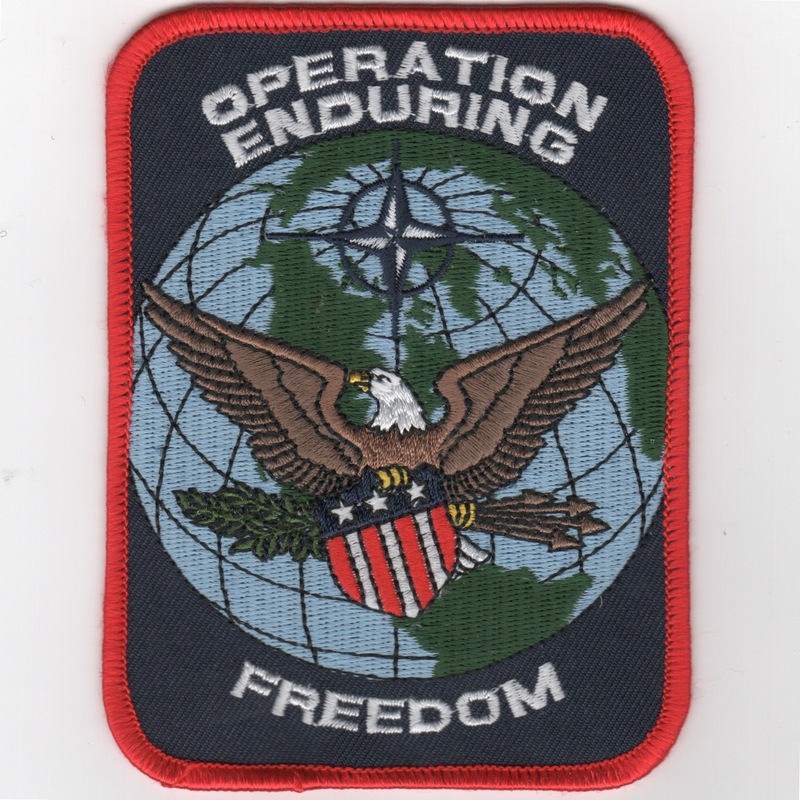 This is the patch depicting the USA's role in handling issues in the SWA theater.....Doing the Job......(of everyone else too). This is the 1999 "Boola Boola" award given for the best aviation squadron in the Pacific fleet. I'm unsure who won that year, but it is a highly coveted award. This is the "2-Prop" version of the "Hamilton Standard" patch stating "We Screw Our Way Around the World". These are cards created by "Airwing Seven" to preserve the history of the F-8 Crusader squadrons. Each card has a different squadron emblem on the front with history on the back. Awesome cards for patch beginners to use to learn about all the squadrons and for patch veterans to find that one missing patch! These are very high quality cards. 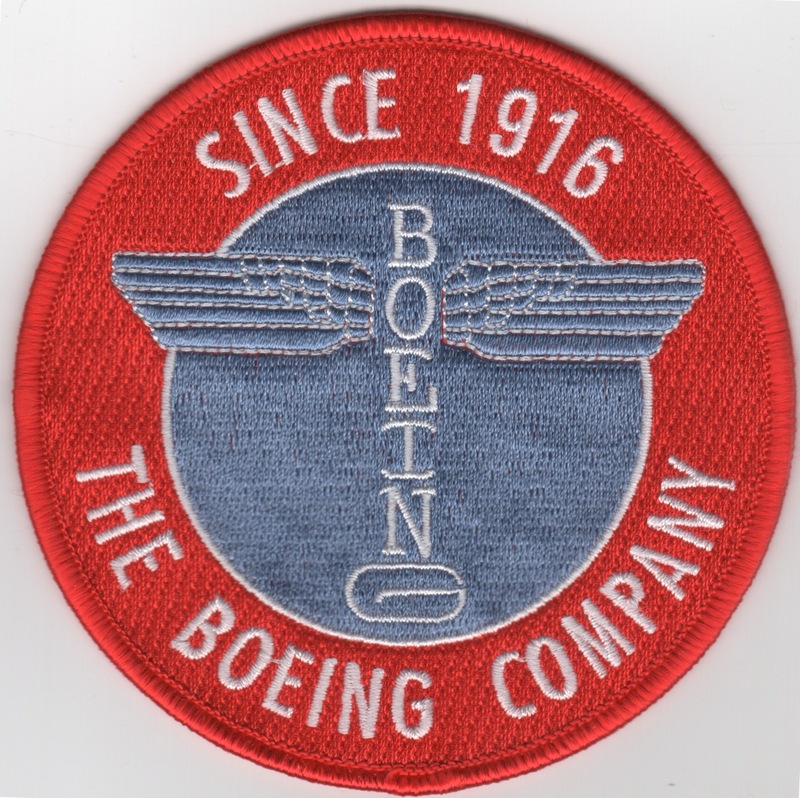 This is the red version of the 'Logo' patch created by 'The Boeing Company', a pillar in the aviation industry and the US Military. This patch does not come with velcro attached. 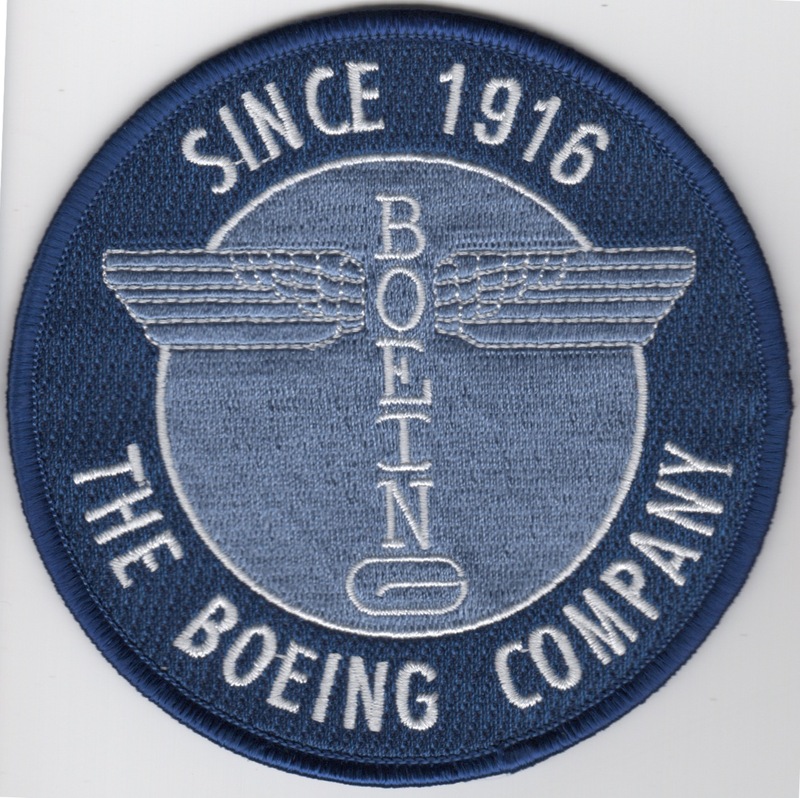 This is the blue version of the 'Logo' patch created by 'The Boeing Company', a pillar in the aviation industry and the US Military. This patch does not come with velcro attached. 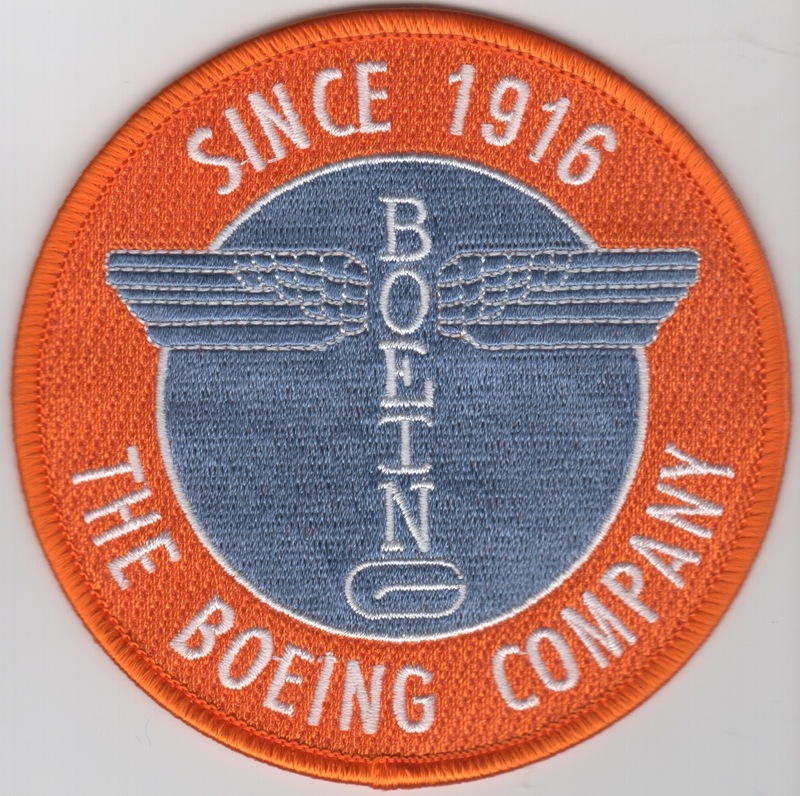 This is the orange version of the 'Logo' patch created by 'The Boeing Company', a pillar in the aviation industry and the US Military. This patch does not come with velcro attached. This is for the red, blue and orange versions of the 'Logo' patch created by 'The Boeing Company', a pillar in the aviation industry and the US Military. These patches do not come with velcro attached. Homepage | Order Misc USN Patches!